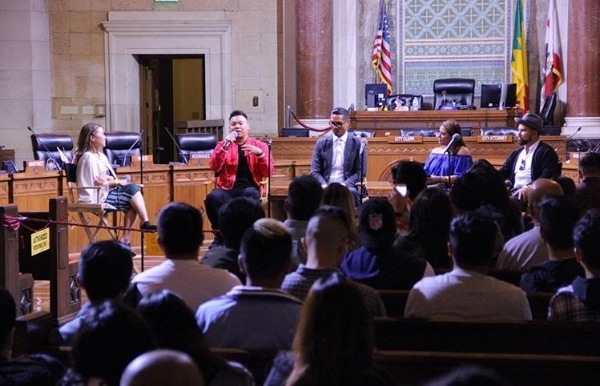 Fil Am Game Changers, a panel and conversation with select Filipino Americans, closed this year’s Filipino American History month in Los Angeles. Aimed to inspire the upcoming generation of media talent in the Fil Am community and hosted by Los Angeles Councilmember Gil Cedillo, Fil Am Game Changers filled city council chambers in LA City Hall on Thursday, October 25th and featured panelists Actress/TV host Giselle “G” Tongi, Singer/Songwriter/Musican AJ Rafael, KDAY on air DJ/Host PJ Butta, and Production Designer/Art Director Ricky Nierva. Stories of work, struggle, finding themselves, and creating their own spaces were shared, with themes of community, empowerment and growing together. The group shared their experiences in their industries. AJ who’s music began with his family’s encouragement and playing at church, transitioned to MySpace and then YouTube which allowed audiences of all backgrounds to find him. Ricky’s love of art began in childhood, he rushed home to watch cartoons and drew on everything. Ricky was encouraged and supported to continue his drawing and art by his parents. PJ loved music and knew he wanted to do something in music, he began interning at a radio station and then grew from there. He is the first Filipino American on American radio. G Tongi began her career in the Philippines, and at 21 she understood that she didn’t want to be an actress. It was at UCLA that she discovered that she wanted to dedicate her professional life to create content for Filipino Americans because there’s nothing for us that speaks about our experience. And advice was given. “You also can’t be afraid to fail. Every single one of us up here has had some kind of failure, but failure is how you learn,” share PJ Butta. AJ shared the importance of showing his face, and being a representation of what a Filipino American looks like. This night and the space was about changing the game, changing society, celebrating the struggles and successes, and empowering future game changers. The event was organized by Maria Karmina, Natalie Ricasa, Board of Public Works Comissioner Joel Jacinto, and Deputy Chief of Staff Tony Ricasa of First District Councilmember Gil Cedillo’s office. Photos by Richard-Noriel D Taguba, Jr. I sat down with Maria Karmina, organizer and moderator of FAGC, before the panel to get her thoughts on the night. How did you come up with Fil Am Game Changers and the name “Fil Am Game Changers”? Natalie Ricasa, Board of Public Works Comissioner Joel Jacinto, Maria Karmina, and Deputy Chief of Staff Tony Ricasa. How did you choose the panelists? I met Giselle Tongi last year at FPAC as well where I felt an instant connection with her. She had that “it” factor and she had that pure energy of wanting to give back to her community, and that’s so rare to find in any culture. How has the community at large supported you in this? The Filipino American student organizations from campuses like Cal State Fullerton, UCLA (Tony Ricasa and Joel Jacinto are both alumni so there are a lot of Bruins in the house), USC, CSUN have heavily supported us and with them being so young, and being our target demographic for this event, they have blasted it on social media and with that type of support, not only are their friends seeing it who are not necessarily Filipino American but even their parents are seeing it. The word has spread. We are all 100% authentic. Everyone is genuinely here volunteering their time for a specific reason and I think the Filipino community is such a tight circle that everyone just needs to continue to give back because someone has done that for them. What do you want the audience to get out of this night? If we really do put our best foot forward, myself and the four panelists, the goal is to empower, motivate, make them laugh, make them cry, but more than anything, make them believe that their dreams are still real. That begin Filipino American, the tenacity that’s running in our blood, there’s a lot of power in that and we need to hang on to it as long as we can and continue to spread that light and love with each other genuinely. Who is your inspiration in life and what is your biggest driving force? My biggest motivation is my family, especially for something like this because I came here when I was 3, and I saw my family struggle growing up. Being able to give back, especially at a capacity in this sense especially with Los Angeles behind me, all of these city officials, I feel like that’s my way of making my parents proud because they didn’t bring us here to just be basic people. That and also love. Love is a big motivator in my life and I think without love in life it’s not as beautiful. My family will be here. The crazy thing about Filipinos, we ride hard, we roll deep, and that’s how it’s gonna be tonight. I think everyone involved in this, they’re bringing their friends, their family. It’s really cool. What’s next? Will you have more panels, events? We are looking into making this an annual thing for October. We will see how this year goes. Joel is very big on continuing the connection between organizations, between partnerships, and he has a lot of hope for this one. And hopefully next year you’ll see Fil Am Game Changers 2019 with even heavier hitters on the panel.